Add warmth and functionality with this beautiful floor mirror. Proudly made in the U.S.A., this craftsman style floor mirror by the Altenburg Timber Estate Collection demonstrates high quality workmanship with a simple yet classic design. Finished in a warm walnut tone, its rivet trim and handcrafted details add to its quality construction. The use of American made materials and the emphasis on craft lend a distinction you can trust. 30 1/2" wide x 65 1/2" high x 3/4" deep. Hang weight is 46 lbs. Glass only section is 25" wide x 60" high x 1/4" deep. Surrounding frame is 3" wide. Walnut finish. Trimmed with dark rivets details. Wood frame construction. 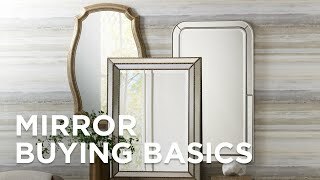 Can this mirror be hung horizontally? BEST ANSWER: Yes, this mirror can be hung either vertically or horizontally. Delivery was extremely prompt. Packaged very well. Arrived in excellent condition.